Elegant, Luxurious, Designer Baby Room Decorating Ideas and Pictures. We would all love to surround our little ones in the luxury of an elegant designer baby nursery. It is a beautiful nursery style! Unfortunately, beautiful as it is, this baby nursery decorating style is certainly not the least expensive. Still if you can afford it, chances are it will fit the rest of your home. And it is a beautiful style ... did I say that already? Soft but stylish neutral colors. Floors are in natural colors often covered with simple, vibrant, high quality rugs. Walls are marbled, sponged or ragged with faux paint effects. Add interest and drama with wall art framed to match the furniture. Draperies topped with swags or scalloped valances cover sheer curtains and add elegance to your nursery design. Tie backs and heavy tassels pull drapery panels to the sides to give the curtain a scalloped look as well as to enhance the window. The sweeping curves of nursery chandeliers! Elegant iron or ebony furniture with scrollwork, embossed designs and canopies draped with luxurious fabrics. 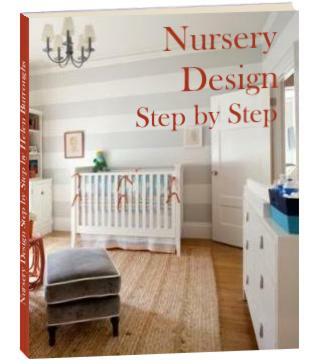 Don't forget to check out the baby rooms gallery for more designer nursery inspiration and ideas.